One of the many props we will have at BritishFest is a full scale Baker Console room with working switches lights, and sounds! It was a big hit when it was first showed off just the console at another local con. So much so we ran out of room for people to watch it being used for a fan film being made. (Photos in the Pictures section) This time at Britishfest it will have more room and the rest of the set and walls finished! Here are two commercials made by two of our guests and friends. This first one is a short one that people from Omaha would get the local humor in it. This second one is a tad longer and more descriptive of some of the stuff you will see at the convention. It also features our newest guest to be at the con, Etta Fy. 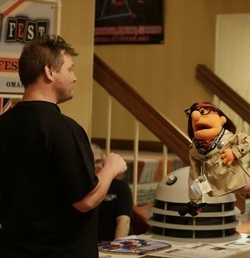 A British Muppet Reporter! What started as a British radio show, quickly turned to a 10 season run. After a slump, it came to the U.S. and gained more publicity. Evenguard has taken some of the games and concepts from this series and have created their own unique style of short-form improv comedy. Come be part of this interactive panel/show! Friday night only! 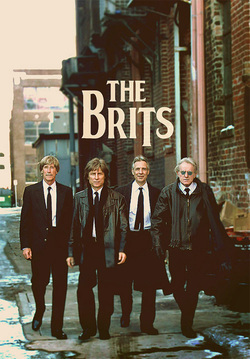 The BRITS is a band based on the historic British Invasion Music of the 1960′s. Their Mission Statement: TO EMULATE, AS EXACTLY AS POSSIBLE, THE SOUND AND STYLE OF THE FAMOUS ROCK AND ROLL LEGENDS OF THIS TIME PERIOD, COVERING THE SONGS WITH THE INSTRUMENTATION AND VOCALS AS ORIGINALLY RECORDED. Lars Pearson is editor-in-chief of many Doctor Who books you may have seen before as well as some other great science fiction. Chicks Dig Time Lords and Chicks Unravel Time are just two of them. He will be on hand to talk to fans and sign his books. Rob is a self made con celebrity who is famous for his one off panels that keep viewer entertained and laughing the whole way through. His special brand of humor is witty and off the handle so you dare not try to sleep while he his on stage in fear of becoming part of the panel. Rob and his Wife Sarah will be giving their special twist on panels to different British shows and movies during the convention. They aim to not disappoint. There will be two panels on how to speak Elvish at Britishfest given by Asuan Johnson. The first one will be Lord of the Rings Elvish: Sindarin 101 and the Elf Lifestyle. In Sindarin 101 not only will the lifestyle of an Elf be covered, but I will be breaking down the complex Elvish language found in ‘Lord of the Rings’ so that every one will have the chance to learn it.She will be covering the pronunciation of vowels and letter combinations, as well as the basic greetings / meetings, partings, and comings / goings. Everything that one would need to speak the basics of Elvish and communicate with other Elves. The second panel Asuan will be giving is Lord of the Rings Elvish: Advanced Sindarin 201 and Elvish Weddings. This panel is the continuation of Sindarin 101 and the Elf Lifestyle. In this panel she will touch up on the Elvish basics and dive further in to the Elvish Language and cover Elvish Naming Traditions to Elvish Weddings From the betrothal to the ceremony, everything in between and after. Jewel in the Lotus Dance Company is an Improvisational Tribal Style belly dance troupe from Lincoln, NE. The dance they create is what they offer joyously to their audience so that they may spread beauty, power, and laughter to their community. One way they accomplish that is by teaming up with their sisters-in-dance from the surrounding Midwest area to bring you: Doctor Who Belly Dance! This is sure to be a fanciful spectacle of The Doctor, the TARDIS, Weeping Angels, Captain Jack and more, all sonic-shimmying down the space/time continuum! Meet and Greet/Q&A session to follow. Can't make the trip to New Zealand to see the Shire? Well now you can let a piece of it come to you! A replica of Bag End is in the bag, so to speak. You can pose with the front entrance of bag End and knock on Bilbo's door. Fredd Gorham is a well known and accomplished Comic book illustrator and gaming/graphic designer. Fredd will be donating all his commissions the entire weekend of Britishfest to his favorite charity, The Juvenile Diabetes Foundation. Fredd can draw you with or as your favorite British Character. list quickly after we are notified. Cancellations may occur at any time, including very close to the date of the event. 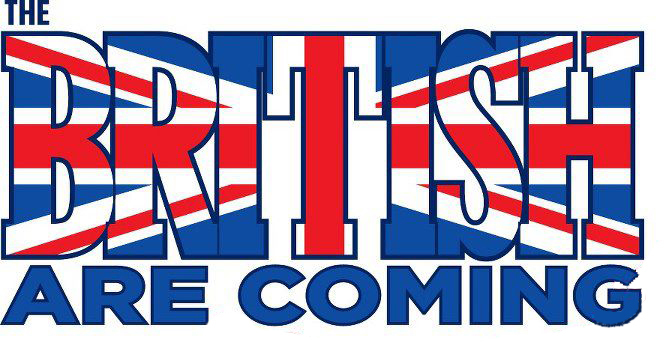 Britishfest LLC and Britishfest.com All rights reserved.